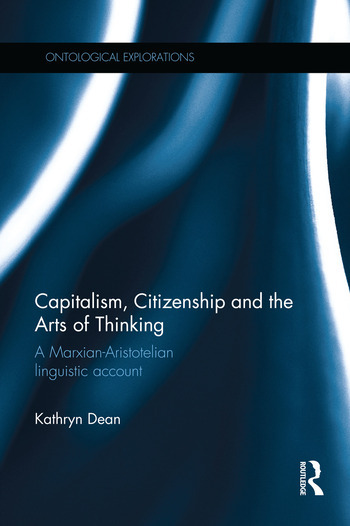 Capitalism, Citizenship and the Arts of Thinking proposes a historical materialist ethic of human flourishing understood in terms of the practice of citizenship. It focuses on the ways in which capitalism’s necessary mode of thinking – analytical thinking – impedes the nurturing of capabilities for citizenship as understood from a Marxian-Aristotelian point of view. It includes a systematic discussion of the Aristotelian resonances in Marx’s critique of capitalism, as well as an elaboration and critique of Alfred Sohn-Rethel’s account of the origins of analytical thinking in his book Intellectual and Manual Labor: A Critique of Epistemology. Dean's critique of this book draws on the language theories of Lev Vygotsky, Alexander Luria, Jack Goody, Eric Havelock and Walter Ong, so as to identify the origins of analytical thinking in literacy rather than in monetised exchange relations, as claimed by Sohn-Rethel. Having traced the development of analytical thinking so as to bring out the ways in which this thinking was a condition of possibility for the division of head and hand in nineteenth-century England, Dean brings the analysis into the contemporary world by examining the changes effected by digitalised communication in terms citizenship capabilities now, drawing on the work of Michael Hardt and Antonio Negri in order to do so. The book's ground-breaking content is in the fusion of Marxian, Aristotelian and linguistic elements to develop a critique of capitalism’s hegemonic mode of thinking (analytical thinking) as manifested in the modern sciences and to show how the draining of intelligibility from the everyday world permitted by this thinking becomes an obstacle to the practice of meaningful citizenship. Its main appeal will be to Marxist thinkers whose main concern is with the alienating, as opposed to exploitative, character of capitalist modes of life. It is written to complement the work of such Marxists, these being, in the main, writers such as Michael Hardt and Antonio Negri and is pitched at researchers in the field. It could be used on post-graduate courses in political theory, as well as social and cultural theory. Introduction Part I. The Materialities of Thinking 1. Citizenship, Thinking and the Education of the Senses 2. Towards a Marxian-Aristotelian Science of Thinking 3. Thinking and Language Modalities Part II. Alienation, Textualisation and the Capitalist Divisions of Labour 4. Writing and the Institution of a Textualised World 5. Alienation and the Capitalist Divisions of Labour 6. Thinking in an Informatised World Part III. From Fordism to post-Fordism, or, The Transcendence of Alienation? 7. Print and the Constitution of a ‘People’ 8. From Nationality to Planetarity: From ‘People’ to ‘Multitude’? Dr Katherine Dean is a Research Associate at the University of London, UK.